Do you have peanut balls at your hospital? Does Your Hospital or Birthing Center Carry Peanut Balls? Peanut balls are exercise balls that are in the shape of a peanut, rather than spherical. Since they are narrow in the middle, and slightly wider on the edges, they are ideal for use in labor. 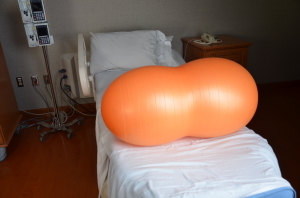 The peanut ball can be placed in between the laboring mother’s legs, helping her to achieve a squat-like position, thus widening the pelvic outlet and easing the baby’s descent into the birth canal. How Can You Get Peanut Balls At Your Hospital? Does your hospital or birthing center carry peanut balls? If not, consider becoming a Peanut Ball Ambassador to raise awareness in your community, provide education and resources to professionals in your area. What Is A Peanut Ball Ambassador? A Peanut Ball Ambassador is a doula, childbirth educator, or birth advocate (whether professional or not) who is committed to make sure those in the childbirth community know what a peanut ball is. What Does A Peanut Ball Ambassador Do? Find out if the facility is interested in holding an in-service presentation for the staff about peanut balls and how to use them. If they are interested in an in-service, refer them to a Peanut Ball Trainer! Are you interested in becoming a Peanut Ball Ambassador with Premier Birth Tools? If you are, you will be provided everything you need to conduct assessments, presentations and you can even donate a Peanut Ball to your local hospital or birthing center! Leave us a comment and let us know if your local childbirth facility has Peanut Balls available for laboring mothers and consider applying to become a Peanut Ball Ambassador!